Writer Jeff Lemire (Sweet Tooth, Hawkeye) and artist Dustin Nguyen (Batman: Li'l Gotham) take the comics scene by storm with the launch of DESCENDER #1—already optioned for film before even hitting the shelves—and collect an outpouring of advance praise. 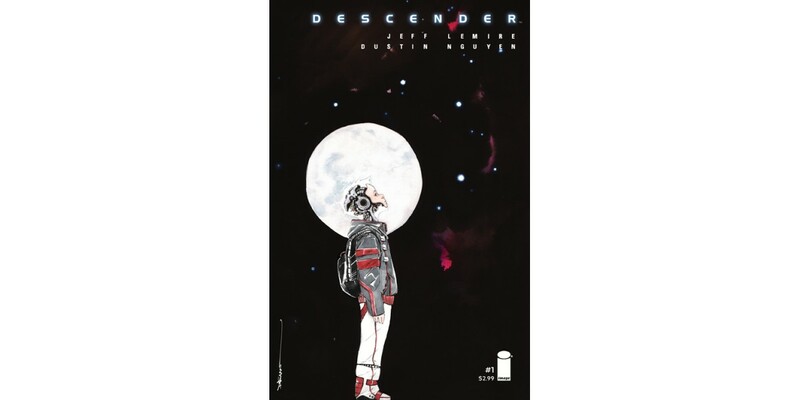 In order to keep up with customer demand, Image Comics is pleased to announce a second printing of DESCENDER #1. DESCENDER follows one young robot's struggle to stay alive in a universe where all androids have been outlawed and bounty hunters lurk on every planet. A rip-roaring and heart-felt cosmic odyssey that pits humanity against machine, and world against world, to create a sprawling space opera. DESCENDER #1 remains available for purchase across all digital platforms, including the Image Comics website (imagecomics.com), the official Image Comics iOS app, Comixology’s website (comixology.com), iOS, Android, and Google Play. DESCENDER #1, 2nd printing (Diamond Code JAN158232), arrives in stores on April 1. DESCENDER #2 (Diamond Code FEB150601) will arrive in stores on April 8.